Cambrian Natural Stone – Hardness: 6 Mohs Absorption: 0.04% Compressive Strength: 1076.6 Kg/cm Crushing Strength: 105.5 N/mm2 Cambrian Natural Stone is a cost effective alternative to our locally cut stone products due to production overseas. Cambrian Natural Stone comes in 3 different stone types, Basalt, Granite and Bluestone in a variety of colours and finishes to compliment your project. Bedrock Natural Stone proudly guarantees all their products. Chilcotin Granite – Density: 2684 kg/m3, 167.56 lbs/ft3 Absorption: 0.177 (per cent) Compressive Strength: 223 MPa Traverse: 10.01 MPa Strength: 32,288 PSI Chilcotin Granite is quarried in British Columbia. This stone has a warm blend of colours of natural brown, gray tones and lustrous silver/gold mica. The Mica allows this stone to be split in flat layers which makes the Chilcotin Granite an ideal flagstone, stacking stone for both dry stack and boulder walls, and facing stone. It will add value to your residential or commercial project. Ledgestone Pattern: Standard Full Stone available in 3″- 5″ thickness with random lengths. Thin Veneer available in ¾”- 1½” thickness. Random Pattern: Standard Full Stone in 3”– 5” thickness with random lengths. Thin Veneer is available in ¾”– 1½” thickness. 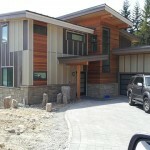 Found in the hills near Whistler, this all weathered volcanic rock is available as columns or building stone. It’s attractive brown, beige, taupe and charcoal blends give it an old rustic look. Mountain Chalet Rhyolite will help any project fit in with the natural environment. Bedrock natural stone Mountain chalet rhyolite comes in beautiful brown, beige, taupe and charcoal blends giving it a timeless and beautiful look. Mountain chalet rhyolite comes in a stone veneer and is used in our West Coast blend. Mountain chalet rhyolite stone veneer is available in a ledgestone pattern with a split (natural) face giving it a linear look. Ledgestone is narrow in height and random in length. It is available in a full stone or thin stone with the full stone carrying a thickness of 3 inches to 5 inches and a height of 2” x 6” with a length of 6 inches to 24 inches and a weight of 50 pounds per square foot. 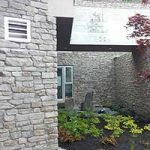 The thin stone Ledgestone pattern comes in a thickness of 3/4 inches to 1-1/2 inches with a height of 2 inches to 6 inches and a length of 6 inches to 24 inches. The Mountain chalet rhyolite ledgestone has a weight of 14 pounds a square foot. The Mountain chalet rhyolite also comes in a random pattern which is a natural weathered face product and has broken joints that nicely compliments our Country Estate Limestone. 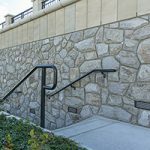 If you are looking for a historical natural stone look then Mountain chalet rhyolite is the natural stone choice. The random pattern also comes in a full stone or thin stone. The full stone has sizes of 6” x 6” up to 14” x 24” and is in random and square shapes. The full stone has a weight of 50 pounds per square feet and has a coverage of 35 to 40 square feet per ton. The thin stone comes in sizes of 6” x 6” up to 12” x 24” and is available in random shapes. Its weight is 14 pounds a square foot. © Copyright 2019 Bedrock Natural Stone . All Rights Reserved.